After a long drought, a handful of books dealing with the Civil War in the Far West have dribbled out over the past year or two, including a reprint of a classic examination of Civil War Los Angeles, another California study, a look at Lincolnian politics in Oregon, and a military history of the Pacific Northwest's Civil War. Next up is Ken Robison's Montana Territory and the Civil War: A Frontier Forged on the Battlefield (no information on it yet beyond a projected October '13 release date). Keep 'em coming. "Civil War General and Indian Fighter James M. Williams: Leader of the 1st Kansas Colored Volunteer Infantry and the 8th U.S. Cavalry"
Lull's biographical sketch of Williams is reasonably good and he does bring welcome attention to a number of small yet significant Trans-Mississippi military events [e.g. Island Mound, Cabin Creek, Honey Springs, and Poison Spring] fought within Missouri, Kansas, Arkansas, and Indian Territory. However, I found the book's tone, content, and interpretative elements problematic in a number of ways. The author's constant 'rah-rah regiment' cheerleading when describing the exploits of the 1st Kansas quickly becomes grating for those of us who prefer our history presented in a more dispassionate manner. Lull also employs some questionable secondary sources and frequently cites secondary sources for direct quotes rather than the original documents. The amount of new information pertaining to these battles, as well as the 1st Kansas's role in them, seems negligible. Additionally, the interpretations of earlier scholars are too often simply repeated in the text, without much in the way of Lull's own reevaluation of the evidence. Finally, little is revealed about Williams himself in his own words, though it's entirely possible sources are lacking in this regard. The most obvious problem with the book, however, is the raw state of the manuscript, more akin to an early galley than a finished product fit to be published by a university press. The writing is unpolished and typographical errors abound. There's even a place in the book where an entire extended passage is repeated word for word, the two blocks of text located only pages apart. UNT Press has published some strong Civil War related titles in the past (see below), but they really dropped the ball on the editing for this one. I cannot recommend this book in its current form. Field: "LINCOLN'S 90-DAY VOLUNTEERS 1861: From Fort Sumter to First Bull Run"
Ron Field's Lincoln's 90-Day Volunteers 1861 is Volume 489 of Osprey's Man-At-Arms series. Slim at 48 total pages, the book is tightly focused on the uniforms, hat wear, and accoutrements associated with the soldiers of these short term regiments. Service history is limited to a brief introduction, an event timeline, and snippets here and there. The study is divided into sections by state [New York – Massachusetts – Pennsylvania – Ohio – Rhode Island – Connecticut – Vermont – New Hampshire – Maine – Delaware – New Jersey – Wisconsin – Iowa – Minnesota – Illinois – Indiana – Michigan] and the District of Columbia. Unit designations are covered, as well as detailed descriptions of the type, color, and appearance of hats, uniforms, and assorted paraphernalia of war. These come from a variety of sources, the more common ones being newspaper articles, soldier letters, and official state documents. Procurement is also within the book's limited purview. Producing companies and the location(s) of their factories are named and shamefully widespread issues of contractor fraud and "shoddy" item quality addressed. Many of these first-issue uniforms and footwear fell apart within days of active use. As with all Osprey titles, illustrations are a prime focus and strength. Numerous rarely seen photographs of 90-Day soldiers accompany the text, with detailed captions. Eight color plates offer fine visual representations of the study's meticulously described outfits. Additional commentaries on the appearances of the 27 fully uniformed figures represented in these plates are located at the back of the book. The audience range for Field's Lincoln's 90-Day Volunteers 1861 is fairly specialized -- from artists, wargamers, and figurine painters to authors and researchers of the early war period seeking a comprehensive catalog of the appearances of these soldiers -- but all should find the volume quite useful to own. 1. The Army of the Potomac: Order of Battle, 1861-1865, with Commanders, Strengths, Losses and More by Darrell L. Collins (McFarland, 2013). Collins has compiled an AoP OB for all its major campaigns in a single oversize volume, using the O.R., Dyer's Compendium, and Heitman's Historical Dictionary and Register of the United States Army. If you're offended by McF's paperback pricing model, don't look at this one! 2. 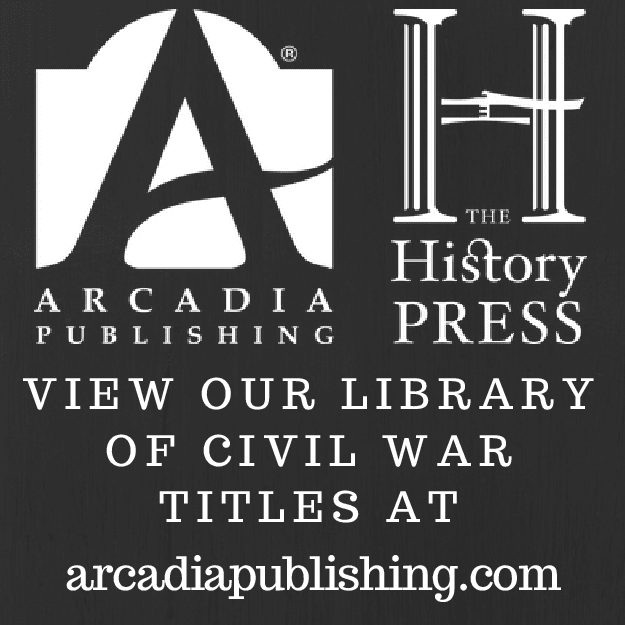 "In Her Hour of Sore Distress and Peril": The Civil War Diaries of John P. Reynolds, Eighth Massachusetts Volunteer Infantry by John P. Reynolds, edited by Jeffrey L. Patrick (McFarland, 2013). This is a rare regimental history of an 1861 90-Day regiment, expressed through the diaries of a soldier serving under Benjamin Butler. Patrick contributes voluminous explanatory notes to what is a welcome first hand account of the important Union operation that secured eastern Maryland and its lines of communication to Washington. 3. The Black Experience in the Civil War South by Stephen V. Ash (Potomac, 2013). "Drawing on memoirs, autobiographies, and other original source materials, Stephen V. Ash details the experiences of blacks who took up residence in Union “contraband camps” and on free-labor plantations and those who enlisted in the Union army." 4. A Civil War Round Table Quiz Book by Dave Smith (Potomac, 2013). 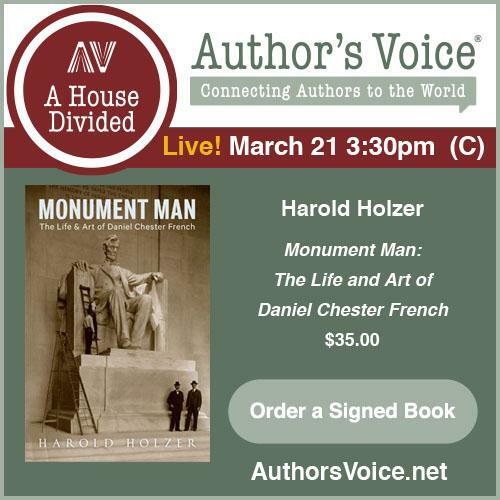 "The book features 117 different quizzes, the subjects ranging from the infamous Dred Scott case to the final surrender at Appomattox Court House. Each quiz has a theme, and the themes have been selected to cover myriad subjects and to lead readers into the lesser-known aspects of the war that they might not otherwise explore." Just a short note, no details yet. 1. Caleb Dorsey Baer: Frederick, Maryland’s Confederate Surgeon edited by F. Terry Hambrecht, M.D. and Terry Reimer (National Museum of Civil War Medicine Press, 2013). Jim Schmidt has a nice writeup [here] about this book on his blog Civil War Medicine. As it is a Trans-Mississippi diary and letter collection, it will certainly be reviewed here, as well. 2. The Civil War in the East: Struggle, Stalemate, and Victory by Brooks D. Simpson (Potomac Books, 2013). A new strategic level analysis of the eastern theater. Last week, the University of Texas Press announced The Texas Bookshelf project, a series of 16 volumes spanning the state's culture and history that promises to "be the most ambitious and comprehensive publishing endeavor" of its kind. Alas, there's no Civil War & Reconstruction focused volume, although the period might merit mention in the general history book that kicks it off. 1. The Civil War on Hatteras: The Chicamacomico Affair and the Capture of the U.S. Gunboat Fanny by Lee Thomas Oxford (The History Pr, 2013). My first impression of this one is that it's a well researched and quite detailed history of the incident. It should spark the interest of those studying the very early stages of the war in general and along the North Carolina coastline in particular. 2. Service With the Missouri State Guard: The Memoir of Brigadier General James Harding by James E. McGhee (Oak Hills Pub, 2000). Harding was the chief quartermaster (I think) of the MSG and his memoir, annotated by Guard expert Jim McGhee, is a valuable commentary. I'm glad to finally get my hands on a copy. There aren't many out there. 3. Connecticut Yankees at Antietam by John Banks (The History Pr, 2013). A collection of biographical shorts for Connecticut soldiers that fought at Antietam by journalist and blogger John Banks. Reardon & Vossler: "A FIELD GUIDE TO GETTYSBURG: Experiencing the Battlefield through Its History, Places, and People"
The academic presses affiliated with the Universities of Kansas, Nebraska, and Tennessee all publish fine battlefield guidebook series, but Carol Reardon and Tom Vossler's A Field Guide to Gettysburg from UNC Press has features and depth rivaling the best of them. For the price, the presentation is fairly spectacular, with color photography, abundant color maps, and durable paper. Several pages in length, this part contains a narrative account of military events associated with the location. Unlike most guidebooks, the text is sourced (with the notes located at the rear of the book). In support are modern color photographs (sometimes with noteworthy points labeled), archival B&W images, and multi-color maps. The map set is quite impressive, with unit movements and locations at regimental and battery scales. The full array of terrain features is also depicted. A listing of regiments and/or brigades that were present, often with numbers data included. Brief biographies of the leadership of both sides (brigade level or higher) are located in this section, with photographs. Casualty levels, including regimental totals, resulting from the fighting around each stop are listed. In addition, a subsection titled Individual Vignettes are often present, offering a more personalized insight into the battle's terrible losses. The extent by which the civilian presence is emphasized is a unique component of this guidebook. It is much more than just mentioning house and farm family names. 6. What Did They Say About It Later? This is another section that sets A Field Guide to Gettysburg apart from the typical Civil War battlefield guidebooks. In addition to offering excerpts from veteran letters, memoirs, and memorial dedications, the written records of civilian observers and even historiographical issues are discussed. A visitor with only a few hours to spare on a Gettysburg battlefield tour might be better served by the more economically detailed volume from the Nebraska series, but I would wholeheartedly endorse that serious battlefield trampers give Reardon and Vossler's guide a trial run in the field. For those not able to travel to the site, there's also more than enough material inside the book for satisfactory home reading. 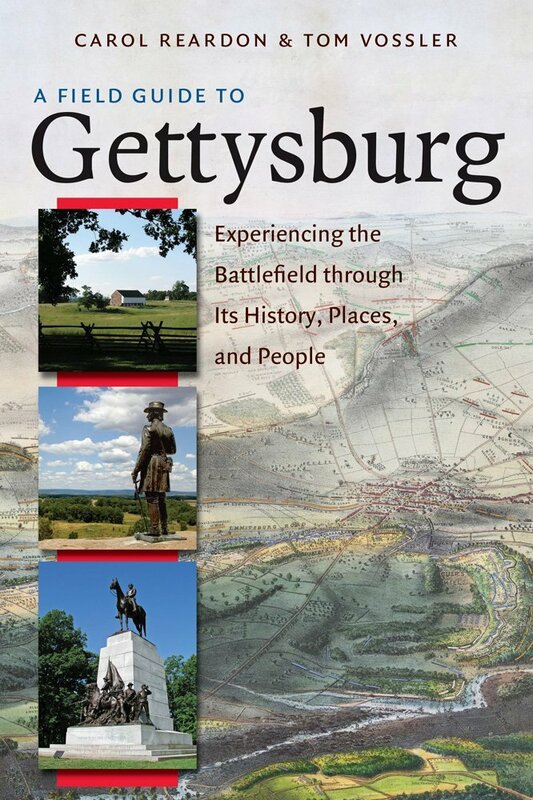 The format, presentation, and material quality of A Field Guide to Gettysburg is very appealing, and one hopes that UNC Press might consider using it as the flagship launching of their own series of battlefield touring guides. 1. Marrow of Tragedy: The Health Crisis of the American Civil War by Margaret Humphreys (Johns Hopkins UP, 2013). A broad observation of Civil War medicine, Humphreys's study examines the work of female physicians, contrasts Union and Confederate medical systems, discusses diseases and treatments, and assesses the work of hospitals and sanitary commissions. 2. Shenandoah Valley 1862: Stonewall Jackson outmaneuvers the Union by Clayton and James Donnell (Osprey, 2013). Volume 258 of Osprey's Campaign series, it's hard to believe this one hasn't been done before. Expect the typical treatment, short narrative augmented with a bevy of illustrations, maps, and original artwork. 3. 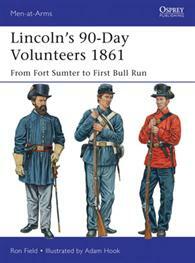 Lincoln's 90-Day Volunteers 1861: From Fort Sumter to First Bull Run by Ron Field (Osprey, 2013). A new release from the Men-at-Arms series (Volume 489! ), this book provides a synopsis of the organization, equipment, uniforms, and history of the first 90-Day regiments from a variety of states, complete with photos and full-color painted figures. Manny will need this for his early war dioramas. 4. Barksdale's Charge: The True High Tide of the Confederacy at Gettysburg, July 2, 1863 by Phillip Thomas Tucker (Casemate, 2013). Tucker's new book joins a long line of Gettysburg microhistories. 5. American Indians and the Civil War edited by Robert K. Sutton and John A. Latschar (Eastern National, 2013). Casto: "ARKANSAS LATE IN THE CIVIL WAR: The 8th Missouri Volunteer Cavalry, April 1864 - July 1865"
As its title and subtitle suggest, David Casto's Arkansas Late in the Civil War: The 8th Missouri Volunteer Cavalry, April 1864 - July 1865 is a local history-regimental study hybrid. Fortunately or unfortunately, the 8th spent the entirety of its service in the Trans-Mississippi theater while at the same time managing to avoid nearly all the great battles fought there. As Casto mentions, the regiment didn't play a prominent role at Prairie Grove. It did fight in the campaign to capture Little Rock, but was not present at Arkansas Post, Helena, the Camden Expedition, or in Missouri opposing the 1864 Price Raid. Casto chose to concentrate his research and writing on April 1864 onward because that was the period when his ancestor served with the regiment. 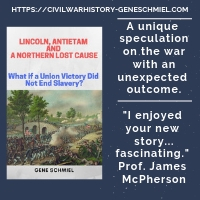 It also marked a time of increased military activity north of the Arkansas River, offering the author a signal opportunity to relate the history of a number of expeditions, skirmishes, and battles only lightly addressed in the literature. By the spring of 1864, the Union army was in firm possession of Little Rock, along with a string of other Arkansas River strongholds, but that did not stop regular and irregular Confederate forces ranging throughout the wilds north and east of the capital. The entry of Jo Shelby's cavalry into NE Arkansas, his command having crossed the river upstream of Little Rock against feeble opposition, increased the pace of operations considerably. From their secure bases, the Union army launched several expeditions against these Confederates, and the 8th, as a whole or in detachments, served in most of them. Casto describes these events [a scouting trip to Augusta (resulting in the Battle of Fitzhugh's Woods), the initial failure to intercept Shelby, the Clarendon and Searcy expeditions, the mission to protect the Memphis & Little Rock railroad and hay stations from Shelby's men, and more] in detail. The largest battle fought by members of the 8th was at Jones Station. Shelby's operations in northeast Arkansas have received an increased amount of scholarly attention in recent years, but Casto's accounts of the Union responses to these are the best and most thorough available. The author also appropriately highlights the importance of the Union held stronghold of DeValls Bluff, as well as the river post's recently completed railroad connection to Little Rock, to the logistical network and military occupation of the region. Casto is in agreement with Grant and Halleck that the generals in charge of Arkansas (Steele, West, Carr, and Andrews), officers who spent as much time bickering with subordinates and each other as they did planning operations, did a poor job of defending their district and supplying their forces. While mounted Confederates ranged around in increasing numbers and often with impunity, the Union army in Arkansas could only keep a small proportion of its own cavalry in the field, complaining of a lack of forage. The inability to deal Shelby a telling blow in the spring and summer of 1864 undoubtedly gave the Confederates a good deal of confidence that Sterling Price's much larger force could also cross the Arkansas River and pass through the state later that year on its way to Missouri. Thus, Union mismanagement in northern Arkansas had a significant strategic impact on the conduct of the war, the result of Price's raid being a diversion of resources from higher priority western theater operations. The book's presentation has both positives and negatives. There are footnotes indicating an acceptable level of research, but no bibliography or index. Also, while a number of rarely seen photographs were included, the maps are unscaled, hand drawn affairs. Tracing the movements of the various expeditions, something that was not attempted, would have been very helpful. On the other hand, the set does offer a reasonably good general idea of the 8th's geographic span of operations and includes an interesting representation of the DeValls Bluff fortress complex. 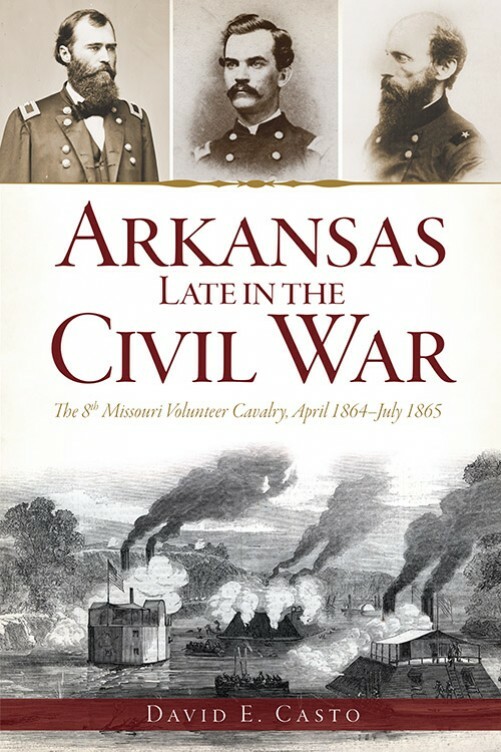 David Casto's Arkansas Late in the Civil War may have begun as a limited inquiry into the service of an ancestor who fought with the 8th Missouri, but the result is much more than that, a very useful and unique history of the Union occupation of NE Arkansas during the final fifteen months of the Civil War. In this recent post, Jane Johansson cites a recent book release and adds a Trans-Mississippi perspective to the more general problem in Civil War historiography (or really any historiography) of uncritically perpetuating unsubstantiated views found in supposedly authoritative secondary print sources. She asks "What “facts” do we read time and time again in secondary sources about the trans-Mississippi? Are they really true?" Jane offers an example, the theater's reputation as a backwater of military incompetents and dumping ground for eastern command failures. In coming up with one of my own, I should really be on the ball and quote directly from some of the relevant secondary sources, but I'm sure most readers have already come across the oft repeated notion that the northern victory at Pea Ridge was the defining event in securing Missouri, or even more fantastically -- St. Louis, for the Union. In truth, while the Confederacy and its local adherents could always threaten the state on a temporary basis, Missouri was in the permanent grip of the U.S. military ever since Lyon's summer 1861 campaign, long before Pea Ridge. Nothing resulting from Pea Ridge could have changed that. With none of the state's railroads and deeply penetrating rivers connecting to Confederate sources, those who repeat this idea of the battle's strategic import seem not to have considered the logistical impossibility of maintaining a sizable Confederate army in Missouri. This inability to seize and hold even remote swatches of Missouri territory for any significant length of time would be demonstrated throughout 1862-64. Does anyone else have a favorite T-M head shaker? Petruzzi & Stanley: "THE GETTYSBURG CAMPAIGN IN NUMBERS AND LOSSES: Synopses, Orders of Battle, Strengths, Casualties, and Maps, June 9 - July 14, 1863"
Unlike World War II, for example, serious order of battle study has not been a significant feature of Civil War publishing. Even the best campaign and battle studies typically offer only a rudimentary table of organization. However, it should come as little surprise that Gettysburg is one of the few areas where one can find such information in print. Osprey Publishing's Order of Battle series has a separate Union and Confederate volume for each day's fighting but the standard resource has been John Busey and David Martin's Regimental Strengths and Losses at Gettysburg (now in its fourth edition). Recently, the publication of John and Travis Busey's Union Casualties at Gettysburg: A Comprehensive Record has provided scholars and students with unprecedented documentation of the Army of the Potomac's losses. Even so, no existing work attempts the type of campaign spanning combination of atlas, orders of battle (OB), strength numbers, and casualty assessments present in J. David Petruzzi and Steven Stanley's The Gettysburg Campaign in Numbers and Losses. Remarkably, beginning with Brandy Station and ending at Falling Waters, the study compiles orders of battle (43 by my count) for Gettysburg Campaign clashes of all sizes, from brief battalion sized skirmishes to the mighty multi-day collision of armies. This has never been done before in a single volume. The amount of data contained in the OBs is also unique. Whereas most Civil War military history books simply list unit hierarchy and perhaps regimental commanders, Petruzzi and Stanley have gone the extra mile, presenting readers with unit strengths; casualties broken down into categories of killed, mortally wounded, wounded, wounded and captured, captured, and missing; loss percentages for each unit; unit commanders and their replacements; and gun types for the batteries. Appreciative of those that have gone before them, the authors have also plowed their own research into the project. While the OBs are not sourced in the form of footnotes, the authors assure us that O.R. reports and rosters located in the National Archives have been consulted, as well as "manuscripts, magazine and newspaper articles, and letters and diary entries written by participants" (pg. VII). The methodology in terms of how they arrived at the numbers is perhaps not as formalized as some might wish, but the authors do denote with an "(est.)" those entries with a particularly high amount of guesswork involved. Summaries of all the battles and skirmishes supplement each OB and the vast majority also benefit from the brilliant multi-color cartographic renderings of Steven Stanley. The maps are such an integral part of the book, one might also consider it an atlas. If readers wonder why a publisher would want to compete with its own catalog in this way, it should be remembered that there's as much variety in mapmaker content, style, scale, and emphases as there is with narrative historical writing, so it never hurts to add another perspective. Complaints are few in number and include repeated use of identical photos (sometimes only pages apart) and occasional lapses in copyediting and proofreading. 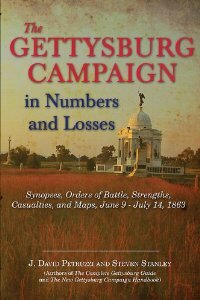 The Gettysburg Campaign in Numbers and Losses is a true one of a kind creation and a very useful addition to the Gettysburg reference library. Hopefully, publisher Savas Beatie does not consider this a one off enterprise but rather the beginning of another long running series.